New evidence in the Troy Davis case in Georgia has recently emerged, further implicating another suspect in the murder of off-duty police officer Mark Allen MacPhail. In 1991, Davis was sentenced to death for officer MacPhail's murder. Davis became the primary suspect after Sylvester "Redd" Coles told the police about Davis's presence at the crime scene. During his 1991 trial, nine prosecution eyewitnesses testified against Davis. All but two of the witnesses (one of whom is Coles) have recanted their testimony. The new testimony was provided by Quiana Glover, who was at a friend's house when she said Coles admitted to killing MacPhail. The Atlanta Journal-Constitution quoted her affidavit as stating that Coles knew the murder was being falsely attributed to Davis instead of himself. In August 2009, the U.S. Supreme Court issued an historic order, continuing Davis's stay of execution and instructing a federal District Court judge in Savannah to hold an evidentiary hearing to decide whether Davis's new evidence clearly establishes his innocence. Legal Scholar Calls Withdrawal of Model Penal Code a "Quiet Blockbuster"
Franklin E. Zimring is a distinguished professor of law and scholar at the Berkeley School of Law who has followed the development of the modern death penalty over many decades. Writing recently in the National Law Journal, Prof. Zimring said the recent action by the American Law Institute to withdraw the death penalty provisions from its Model Penal Code deprives the punishment of any legal legitimacy. "[T]he institute has pulled the intellectual rug out from under the current system of deciding between life and death," he wrote. Recalling that when the Supreme Court stopped the death penalty in Furman v. Georgia in 1972, he noted many states turned to the Model Penal Code to fashion new death penalty laws that the Court would accept. But that model has now been discredited. "Now that the creators of the modern system of death penalty sentencing have disowned that system, there is no support for distinguishing the current death penalty lottery from the lawless system that Furman condemned. The apparatus that the Supreme Court rushed to embrace in 1976 has been exposed as a conspicuous failure." Linda Greenhouse, former Supreme Court writer for the New York Times, recently wrote about the reversal of a death sentence by the U. S. Supreme Court. The Court overturned George Porter Jr.'s death sentence because of the inadequate representation he received and the powerful mitigating evidence in Mr. Porter's life that his attorney failed to investigate and present to the jury considering his client's life. The Court's opinion noted, "Our nation has a long tradition of according leniency to veterans in recognition of their service, especially for those who fought on the front lines as Porter did." Ms. Greenhouse's article contrasted this ruling with one handed down last month in the case of Robert J. Van Hook, who also claimed inadequate counsel. In his case, the Court overtuned a federal appeals court's grant of relief, concluding that Van Hook's lawyer made "professionally reasonable" decisions regarding his case. Van Hook was also a military veteran, and like Porter, was also a product of a violent and abusive childhood. Greenwood writes, "Setting the Porter and the Van Hook cases side by side, what strikes me is how similarly horrific the two men’s childhoods were - indeed, how common such childhoods were among the hundreds of death-row inmates… It is fanciful to suppose that each of these defendants had lawyers who made the effort to dig up the details and offer these sorry life stories to the jurors who would weigh their fate. I don’t make that observation to excuse the crimes of those on death row, but only to underscore the anomaly of the mercy the court bestowed…on one of that number." Read the full article below. Justices John Paul Stevens and Clarence Thomas disagreed over whether to grant a stay of execution to Cecil Johnson, Jr., who was was convicted of murder in a 1980 shooting at a convenience store in Tennessee. Johnson had been on death row for nearly three decades. Justice Stevens said this lengthy time between his sentencing and execution could amount to cruel and unusual punishment: "[T]he delay itself subjects death row inmates to decades of especially severe, dehumanizing conditions of confinement," especially when most of the delay was caused by the state. Justice Breyer concurred with Stevens. Both Justices have long urged their colleagues to address the issue of the extensive time inmates spend on death row. Justice Thomas reacted strongly to Stevens's assertion, claiming that "as long as our system affords capital defendants the procedural safeguards this court has long endorsed, defendants who avail themselves of these procedures will face the delays Justice Stevens laments." James Tyrone Woodson's death sentence was overturned by the U.S. Supreme Court in 1976 because the jury had not been allowed to consider any mitigating factors in his life or about his peripheral role in the crime. The Court not only rejected Woodson's death sentence, but held that a mandatory death penalty system was unconstitutional. Woodson had been convicted in 1974 of first-degree murder, which was automatically punishable by the death penalty under North Carolina law. Woodson had been in a car during the robbery and murder, and he maintained that he was threatened to assist with the robbery. Woodson and 120 other death row inmates' lives were spared because of the Supreme Court ruling. He eventually became eligible for parole and was released in 1993. Since his release, Woodson has led a crime-free life. He used to be the kitchen manager at the Raleigh Rescue Mission. He now has a job in Raleigh and preaches at Wake Correctional Center. "You have to want to change. Nobody can make you change," he said recently about his work helping others. He continued, "There's a choice in the matter in life itself. Do you want to live? Do you want to be helpful to another individual because you've been helped?" On the same day, the Court agreed to hear Magwood v. Culliver (No. 09-158). Billy Joe Magwood received a death sentence for killing a sheriff in 1979 in Alabama. At the time, Alabama law required two conditions before the state could sentence a defendant to death, only one of which was satisfied by Magwood's crime. Magwood's death sentence was overturned on other grounds in 1985, and he was resentenced to death the next year. However, it was not until 1997 that Magwood's lawyers challenged whether his crime was death-eligible under Alabama law. Alabama claims Magwood took too long to raise this argument and his appeal is barred by the Anti-terrorism and Effective Death Penalty Act, which imposes strict limits on successive federal habeas corpus petitions. The Eleventh Circuit agreed. Magwood claims that he is bringing his claim under his new death sentence and therefore is not barred by AEDPA. On November 9, the U.S. Supreme Court granted certiorari in the case of Bobby v. Van Hook (No. 09–144) and issued a per curiam opinion overturning a panel of the U.S. Court of Appeals for the Sixth Circuit, which had granted Robert Van Hook a new sentencing hearing based on ineffectiveness of counsel. Van Hook had been convicted and sentenced to death for a murder committed in 1985 following an encounter in a bar. The Supreme Court held that, judging by professional standards existing at the time of Van Hook's trial (rather than by more recent American Bar Association standards), the attorneys conducted an adequate investigation and provided sufficient representation. The Court said, "This is not a case in which the defendant’s attorneys failed to act while potentially powerful mitigating evidence stared them in the face, cf. Wiggins, or would have been apparent from documents any reasonable attorney would have obtained, cf. Rompilla v. Beard. It is instead a case, like Strickland itself, in which defense counsel’s 'decision not to seek more' mitigating evidence from the defendant’s background 'than was already in hand' fell 'well within the range of professionally reasonable judgments.'" (citations omitted). 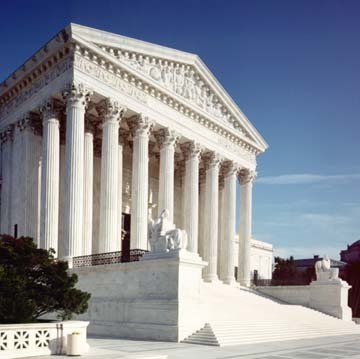 On October 13, the U.S. Supreme Court agreed to hear Holland v. Florida, a case raising the question of "whether 'gross negligence' by a state-appointed defense attorney in a death penalty case provides a basis for extending the time to file a federal habeas challenge, in a case where the habeas plea was filed late despite repeated instructions from the client." (scotusblog.com). In his petition for certiorari to the Court, the defendant stated, "Despite the State of Florida's promise to Petitioner that he have counsel to competently and effectively represent him in both his state and federal postconviction litigation, a promise that would be purportedly enforced by judicial monitoring, Petitioner's state collateral attorney, Mr. Collins, failed to timely file a (habeas corpus) §2254 petition on behalf of Petitioner." The defendant then filed his own petition for habeas corpus and, while admitting it was filed late, asked that the deadline be extended because of the serious error by his appointed attorney.